Freezing cold rain mixes with snow, creating streams of slush that run down the side of the mountain while also freezing a layer of ice on the cold rocks and trees. The hunter caught in this storm ducks underneath a large pine tree. It's late spring, but in the mountains snow still remains. Even so a pocket of grass and meadow flowers have started to grow on the sunny side of the mountain which the hunter hopes will lure the hungry deer close enough for him to shoot one with his bow. He is still fairly close to his village, close enough that he could see it if it in the valley below weren't for the rain, but it would will still take more than two hours for him to walk through the trees back to it. For in these mountains physical distance is meaningless, raging rivers, streams, thick brush, rocks, forest and the mountains themselves all hinder travel. It could take nearly a day to walk to the next village over, so people rarely do. 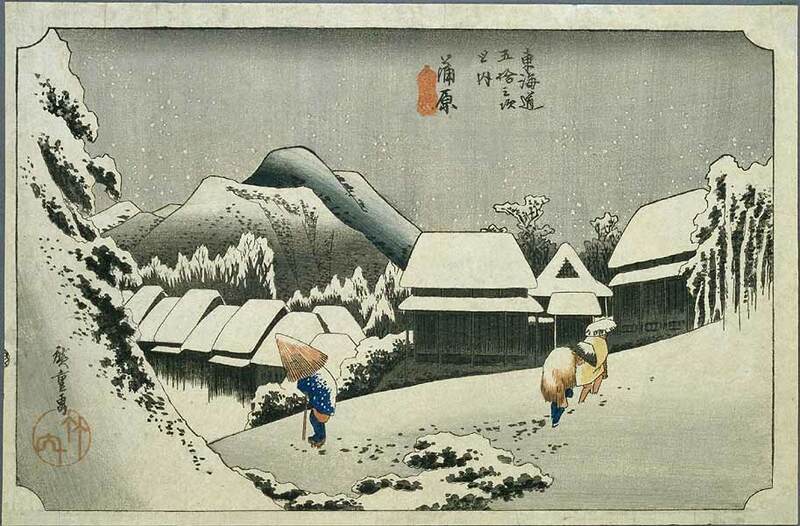 In Japanese Lore it wasn't just distance that kept people from traveling from one village to another, for Japan is a rough land with harsh mountain weather making it difficult and treacherous to walk from one place to another. So treacherous that people once believed that Japan's the paths and forests were haunted. In early Japanese lore the kami, or gods of the wilderness which lived in passes, river fords, and mountain paths were wild and so killed half the people who tried to pass through them. Wolves, bears, magical tanuki, foxes, otters, and tengu all haunted the mountains as well, hunting travelers, carried them off or lured them astray. And than there were the others; other clans, bandits, outcasts, people who for some inexplicable reason seemed to dwell in the wild and the Emishi who were the native peoples of Japan. A people so good at fighting that although they had been greatly outnumbered they fought furiously against the Japanese for well over a thousand years. It was the isolation of the many villages within the mountains that caused Japan to develop the way it did contends a number of folklorists. Here, in tiny pockets of civilization, surrounded by a wilderness filled with potential dangers people made family and village the center of their worlds, rather than individual self. This is why when a village met to discuss potential actions they would talk until everyone came to a consensus on what to do, rather than simply accepting a majority vote. It is also why people were often refereed to not by name but by their place within a family. Thus someone talking about the father of a house to the west might refer to them as the “Father of the Western House.” This father for his part would have his identity tied to his place in the house. As the father he was stern, seemingly aloof and unapproachable for the other members of the family, a few years before, when his father had been the Father he had been more at ease, in a few years when he became grandfather he would be even more at ease. Further the mixture of danger from other groups of people and the challenge of dealing with the forces of nature likely contributed greatly to the idea that nature spirits themselves had to be defeated and or pacified through offerings. In early Japan people not only had to contend with the danger posed by neighboring clans which could at any moment decide to attack in order to take more land, they had to contend with other peoples. Initially Japan was inhabited by the Emishi on the central island, the Aino to the North and the Ryukyu to the south. Than came the people of the Yayoi culture who eventually came to conquer Japan. Early on the Yayoi culture was not united, however, they were divided into multiple warring clans. Disputes over land and water rights were also likely extremely common in early Japan and even through to the Meiji era. In folk lore such disputes were not only between people but between kami. Before 800 AD there were a number of tales of kami fighting over water rights which many scholars think represent tales of disputes between villages. Other tales of kami battling against travelers and society are thought to be tales of the Emishi and villages of Japanese people who didn't want to come under Imperial control. The danger of attack from other peoples, as well peoples dependence on natural phenomenon such as mountains, rivers and the sea which provided food and life, yet at the same time were also the source of great destruction such as volcanic eruptions, floods, and tsunamis. We see the importance of the village manifested through the importance of the village boundary. It was at these boundaries which people would erect shrines or place stones which were supposed to be the homes of a protective kami. Rituals to drive away noxious insects, plague, spirits, and more would all end at this village boundary. Other communal prayers with the help of a medium would take place here to protect the village from the outside. Indeed the world outside the village could almost be likened to an other world from which evil spirits, disasters and the like could attack. This is why people so often encountered such things at the edge of the village. Indeed the world outside the village was often considered an other world, and on occasion a person leaving the village might inadvertently stumble into this other world of spirits. Having developed with so many isolated villages Japan doesn't have a single coherent folk religion but is divided into hundreds of related folk religions. It is true of course that when the Emperors clan defeated the others he began to issue decrees in order to solidify his control, which included making his own local folk religion into the national religion by codifying it as Shintoism. The Emperors would also pass decrees in 780 AD and 807 AD against the use of shamanism and similar magical practices outside of shrines. Despite the best efforts of the central government, however, independent shamans and magicians continued to play an important roll throughout Japan and were even the dominant force in many parts of Japan. This situation continued until 1873 when all forms of shamanistic ecstasy practices were outlawed, this law drove shamanism underground and likely played some roll in the intensity of peoples hatred of certain types of witch families. It was also largely responsible for the fact that by the 1960s most young people didn't believe in shamanism anymore, even in villages which had strong traditions and even still retained a few shamans.